It's the first factory in the world dedicated to self-driving cars. Alphabet-owned driverless car company Waymo has received approval from the Michigan Economic Development Corporation to build an autonomous vehicle factory in the state. The news comes after General Motors laid off 15 percent of its salaried workers and closed five entire auto plants — including one in Michigan — in the U.S. and Canada in November. The cars Waymo is planning to assemble are modified versions of the Fiat Chrysler vans and Jaguar Land Rovers that have been outfitted with advanced self-driving sensors and other hardware. 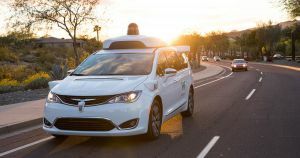 Waymo is already using Hybrid Chrysler Pacifica minivans as part of its efforts to expand autonomous ride-hailing services in Phoenix, Arizona. It launched the world’s first self-driving taxi service back in December, although its operations are limited to a suburb of Arizona’s capital. It’s a big stepping stone for the future of autonomous vehicles — especially considering Michigan’s longstanding history with the automotive industry.